Smokey Amp, Made in USA. 1 watt(?) worth of sonic blaze, powered by a nine volt battery (included and not an almost empty one either) and ability to power any 4, 8 or 16 Ohm speakers. I have prior experience from Vox Amplug and its matching cabinet, but didn't like it at all. It sounded tinny (who would have guessed?) and buzzed the moment you put the power on. Surprisingly Smokey sounds better even though it has even smaller speaker at 2 inches (versus 3 in Vox). As I'm pretty soft handed player I can even some get decent cleans out of this thing, but that might not be the case for everyone. You really have to experiment with your volume and tone controls. I tried it quickly with P90s and got no humming, no buzzing, just the growling goodness of the pickups. Maybe the best sound I was able to get out of it was with the neck pickup and the tone rolled off. Pure fuzz craziness! I also quickly connected it to my Blackheart BH110 cab and have to say that I liked the sound alot. Now, this isn't your main everyday amp nor it tries to be, but the fun factor is unbelievably high and it pretty much forces you to experiment not only with your guitar, but with the amp itself (throw it in the bucket for reverb, open your mouth against it for talk-box effect, etc). I have to try it out with my other guitars as soon as I can, so I'll be reporting back with my findings. Again, as a lo-fi kind of guy this is just my alley, but might not be for everyone. Holy Crap it's the 90's all over again! Is there a "How To" on something like this? Might be fun to give it a try someday. 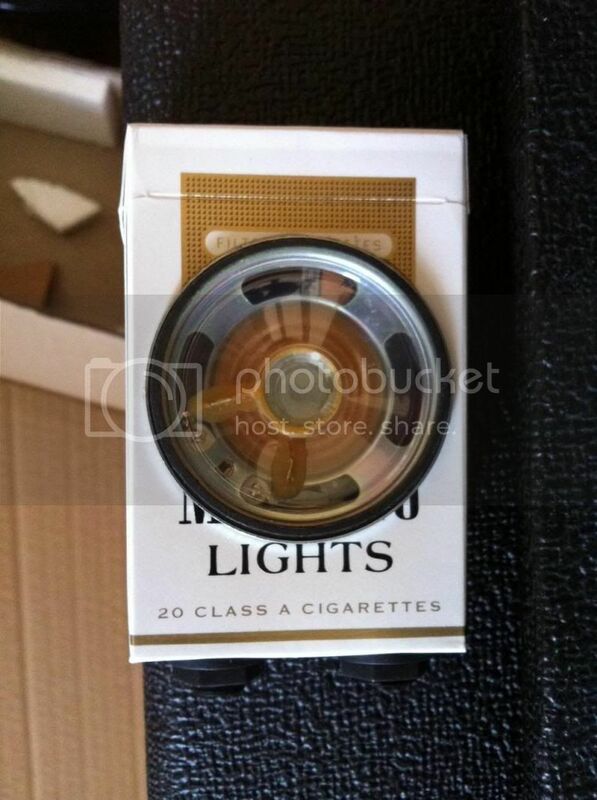 I wonder of a pack of Cools or Camel straights would offer different timber than the Marlboro lights? I'm going to through myself into development stage sometime and see what I can create for a bass reflex guitar amp made from a toilet paper roll tube!! I'll also experiment on the bottom end I can create with a tuned port of a Christmas wrapping paper tube or a paper towel tube as well. All will be based on a small speaker & solar powered 1 watt amp that works in total darkness if Infrared light is present. "Life is too dang short to eat ratty tast'n peaches!" Well it took a bit longer than expected, but now I've had the Smokey for what, maybe two weeks(? ), and tested it out with my other guitars as well. I have to say I still like it. As an practice/warm-up tool it's great, but I've been mostly using it as an amp head. Since I like how it sounds, I've been eyeing the dedicated Smokey amp head as well. Anyone tried one? Supposedly they should be more suited for such use, whatever that means in practice. Try running an a/e through it with the smokie in a bucket, jar, whatever. Sounds great! Blew my mate out with it, he couldn't believe it. I've had mine for 4 years or so, put it in my gig bag pocket and promptly forgot about it( yes, I know I'm a candidate for Old Timer's Disease). This thread reminded me of it so I got it out, changed the battery, and been playing with it ever since. Have'nt tried it as a head or fuzz yet though- might do that today. Just tried the Smokie as a head for myV Junior combo- Well , I'm amazed! I wonder how long it'd take to chew up the battery? I saw an episode of Letterman(?) where a band did their performance using Smokies like this through big cabs, and didn't really understand at the time, and just blew it off. I'm about to try and hunt down that footage to re-watch it.